An apartment block damaged by car bomb in the southeastern Turkish city of Diyarbakir, Nov. 5, 2016. The Islamic State reportedly claimed responsibility for attack that left several people dead. A new chief spokesman for the Islamic State is urging supporters to target the terror group's enemies wherever they find them and "burn the ground under their feet." IS, through it's al-Furqan media division, released an audio recording of Abu Hassan al-Muhajir, naming him as the replacement for Abu Muhammad al-Adnani. Adnani was killed in a U.S. drone strike near al-Bab, Syria August 30. “Attack them in their markets, roads, clubs and any unexpected location," Muhajir said, according to a translation by Rita Katz with the SITE Intelligence Group. "Your operations make a difference…change the situation." Muhajir also promises new attacks on the U.S., Russia, Europe and Iran in a speech titled, “For You Will Remember What I Tell You.” But he reserves considerable venom for Turkey. He tells IS supporters to attack "the secular, apostate Turkish government in every security, military, economic and media place even every embassy and consulate that represents it in all the world's countries." The rhetoric seems to build on similar exhortations by IS leader Abu Bakr al-Baghdadi in an audio recording released in early November. Baghdadi urged IS fighters to "unleash the fire of their anger" on Turkish troops. 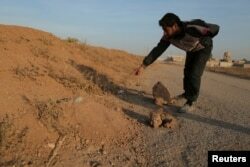 A resident points to what he believes is a land mine in the village of al-Heesha in Raqqa district of Syria after it was captured from the Islamic State, Nov. 15, 2016. Terror analysts also note much of Muhajir's phrasing is reminiscent of that of his predecessor, known for encouraging and inspiring the terror group's supporters to launch attacks on their own, as so-called "lone wolves." “His address highlights continuity in relation to the group's unwavering aspirations to mobilize attacks in the West, and confirms Turkey will continue to be a priority theater for the group's external operations," said Michael Smith, co-founder of Kronos Advisory, a private intelligence firm. What is less clear at this point is the extent to which Muhajir will be anything more than a voice. Abu Muhammad al-Adnani had been a founding member of IS, and in addition to being the group's chief propagandist, he was the architect of the group's external plots and leader of its internal security branch.